This is the first part of our 4-part series “Hip Dysplasia in Dogs”. In this part we’ll cover what hip dysplasia is, and what the causes and symptoms of hip dysplasia in dogs are. Hip dysplasia in dogs is a disease that seriously affects the hip joint that attaches a dog’s hind leg to its body. The hip joint is a ball-and-socket joint. The ball portion is the head of the femur (the main bone in the thigh) and the socket is located on the dog’s pelvis. In a healthy, normal joint the ball rotates freely and easily within the socket. The dog’s bones are shaped to perfectly match each other, with the socket surrounding the ball. In order to strengthen the hip joint, a strong ligament holds the two bones together. This ligament attaches the femur head directly to the socket. The joint capsule is a very strong band of connective tissue that circles the two bones and provides stability for a dog’s rear legs. In healthy dogs, the area where the bones actually touch each other is smooth and cushioned with a layer of spongy cartilage. The hip joint also contains a thick fluid that keeps the joint lubricated. In a dog with normal hips, all of these components work together and help the joint function smoothly which supports the dog in maintaining stability. Hip dysplasia is a result of abnormal joint structure and a slackness of the muscles, the connective tissue, and the ligaments that support the joint. As a dog’s hip joint continues to deteriorate, the surfaces of the two hip bones begin to separate in the joint and cause structural changes in the bone surfaces. As the cartilage is progressively worn away, the pain becomes intense when the dog stands or walks. Most dogs are born with normal hips but if their genetic background includes a tendency for hip dysplasia or arthritis, the soft tissues that surround the hip joint will develop abnormally and cause hip dysplasia. The disease can affect both the right and left hips, but more often affects only one side. Hip dysplasia symptoms are nearly identical to arthritis symptoms which causes a dog to walk or run in a limping or odd way. A dog may avoid movement that requires fully extending or flexing its rear legs. They will also experience stiffness and pain in their rear legs after exercising or when they first get up in the morning. Climbing stairs becomes a difficult if not impossible task. As hip dysplasia progressively worsens, affected dogs will lose most of their muscle tone and may need assistance in getting up after resting in a prone position. If you notice any of the signs below, visit your veterinarian as soon as possible. An early diagnosis, is the key to a successful treatment. Also, as with any other illness, be in the lookout for changes in your dog’s personality, behavior and appetite. Dogs of all ages are subject to hip dysplasia. Usually hip dysplasia symptoms don’t begin to show up in a dog until the middle or later years of its life, although puppies as young as five or six months may begin to display pain and discomfort during and after exercise. The condition will usually worsen until all normal activities become too painful for the dog to tolerate. You can help your dog recover its normal life through the use of Winston’s Joint System, an all-natural formula developed by a Naturopathic Doctor to heal his own beloved dog who suffered from hip dysplasia. For more than 20 years this proven formula has been giving relief from pain and stiffness to all breeds and ages of dogs. Which dog breeds are susceptible to hip dysplasia? Hip dysplasia is primarily a disease of large breeds like Golden Retrievers, Labrador Retrievers, Saint Bernards, German Shepherds, Rottweilers, and Great Danes. The disease can affect medium-sized breeds also, but rarely affects smaller breeds. Hip dysplasia is also primarily a disease of purebred dogs but can develop in mixed breeds if their parents were breeds of dogs prone to developing hip dysplasia. ⇒ Read more about the dogs who develop hip dysplasia. Are there specific risk factors for developing hip dysplasia? 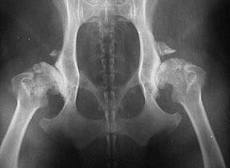 Hip dysplasia is caused by one of the hip joint bones moving out of place. This creates abnormal wearing away of the joint tissue and cartilage. Arthritis and pain then increase as the dog ages. It is a genetic disease, meaning if one or both of a dog’s parents has hip dysplasia, then it is at a greater risk for developing the disease. If a dog’s lineage showed no signs of hip problems, then it probably will not develop dysplasia. Obesity can increase the seriousness of hip dysplasia in genetically susceptible dogs. If a dog is genetically prone to hip dysplasia and is also overweight, it has a much higher risk of developing hip dysplasia. Exercise can also be factor in developing the disease. Dogs that are genetically predisposed to the disease can have an increased incidence of hip dysplasia if over-exercised when they are young. However, dogs with large leg muscles are less likely to develop hip dysplasia than dogs with small muscles. Moderate exercise such as running and swimming would be beneficial to a dog, but any exercise that places a lot of pressure on the joints would not be.